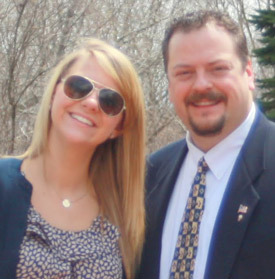 Dr. William Macnamara with his daughter Alex. My neighborhood in Freehold, NJ must have had some significant peer pressure. Our little town produced at least 8 chiropractors and we all went to the same chiropractic school. My neighbor who was almost done with chiropractic school said I should become a chiropractor. She said I would love it. I always loved to work with my hands, be it physical, play sports and solve puzzles. Having never been to a chiropractor I was skeptical. I contacted Life Chiropractic College and they contacted a local chiropractor in Columbia, SC who called me up and explained what a chiropractor does for a living. I was sold. My neighbor Dr. Eileen McGough was right, I love being a chiropractor. I attended the University of South Carolina (Go Gamecocks!) and graduated in 1986 with a B.A in Political Science. I went to Life University School of Chiropractic and graduated in 1991 with a Doctorate in Chiropractic. Board Certified Chiropractic Sports Physician (CCSP) from New York Chiropractic College in 2009. My practice philosophy is to treat the whole person, helping to restore their quality of life, and have a great time in the process. Laughter in our office is almost non-stop. Everyone knows everyone, the music is country (no elevator music) the energy is high and we provide quality chiropractic care in an efficient, experienced manner. Treatment is tailored to the individual patient. I am versed in many chiropractic techniques from very gentle to the usual adjustment delivered by hand, including: Diversified, Thompson, SOT, Toggle, Activator, Torque Release and the Impulse IQ adjusting instrument. Extremity and soft tissue work are done in the office on a regular basis by me. We also make custom orthotics using a computer scanner, provide nutritional and diet advice and utilize Standard Process and Metagenic supplements rounding out the “whole person”. I am married with 2 children who have grown up attending St. James School and then Woodstock Academy. Now that I am no longer coaching soccer or watching the kids play football or lacrosse, I am active in the community. I am currently the Treasurer of the St. James Council 2883 Danielson Knights of Columbus and the District Deputy. I also serve on the Zoning Board of Appeals in Brooklyn.